David Kuack ([email protected]) is a freelance technical writer in Fort Worth, Texas. Trying to control pests effectively on a wide variety of crops is a major undertaking. Delray Plants in Venus, Fla., has been using biological controls as a part of its pest control program for more than 10 years. It operates 300 acres, which includes covered structures and 7 acres of outdoor field production. The size of a greenhouse operation is one of the biggest factors when determining the type of electrical system to install. Part 2 of “Don’t Let Your Electrical System Come Up Short” covers locating electrical wires, meeting electrical load demands and environmental considerations. Ensuring your greenhouse has enough electricity to operate all the equipment that is installed takes planning and consideration of an operation’s needs. Part one of two articles on greenhouse electrical systems covers choosing an electrician, meeting immediate and future needs and planning for back-up power. A father-and-son team find LEDs deliver a higher rooting rate for cuttings propagated under the lights. The outdoor decorative containers that Oakland Nursery plants and maintains in downtown Columbus, Ohio, enhance the look of the city’s buildings and streets and hinder vandalism. Adverse weather conditions in Canada have played havoc with the peat moss harvest. Learn about how the sustainability program being developed by the California Cut Flower Growers’ Association (CCFC), in cooperation with SureHarvest, can help you. This summer, the California Cut Flower Commission released a grower self-assessment sustainability workbook. Next on the commission’s agenda is to roll out a comprehensive sustainability certification program. Meeting The Demand For Edibles: Go Green Agriculture Inc.
Read about how Go Green Agriculture Inc. took its business from the classroom to commercial reality in one of four articles on how growers are appealing to the growing interest in edibles. Interest and response to Peace Tree Farm’s annuals and foliage plants continues to increase, but herb and vegetable starter plants is where the company makes its money. Read about it in one of four articles on how growers are appealing to the growing interest in edibles. Grants brought opportunities for High Meadows Farm to start growing raspberries and tomatoes. Read about it in one of four articles on how growers are appealing to the growing interest in edibles. 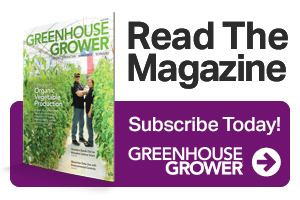 Read about Altman Plants’ venture into greenhouse vegetable production in one of four articles on how growers are appealing to the growing interest in edibles. It takes vigilance and frequent testing to keep plants at optimum fertility levels. A retractable roof greenhouse enables Lucas Greenhouses to start and finish part of its spring crop earlier and provides a superior production environment into the fall. Growers are taking advantage of the USDA-Natural Resources Conservation Service’s Seasonal High Tunnel Initiative to extend the production season for a variety of crops. Two growers explain the benefits their businesses are finding from sustainable certification, not only in environmental aspects, but also in better financial margins and improved business management. Both Lean Flow and MPS sustainability certification raise D.S. Cole Growers in New Hampshire to a level of being more professional, with tighter margins and better employee processes, says Doug Cole, the company’s owner and president. Growers of short-term vegetable or ornamental crops should have an easier time switching from conventional mineral fertilizers to organic fertilizers. Thinking about making your own growing mixes to lower costs? There are many things to consider before taking the plunge. With the ability to deliver specific light wavelengths with LED lights, growers, retailers and consumers could eventually manipulate the scent, color, flavor, postharvest life and other characteristics of ornamental and edible crops.